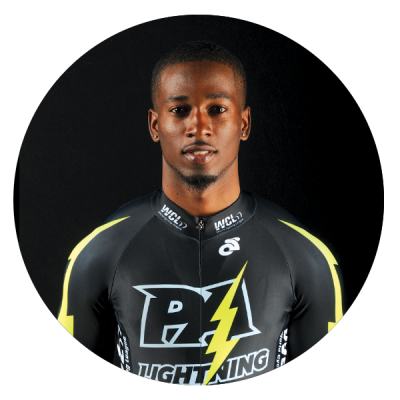 Kwesi is an international competitor who has raced in multiple countries outside of the US, including Germany, Canada, New Zealand, Italy, Poland, Mexico, and in his home country of Trinidad and Tobago. In 2015, Kwesi stormed into the American Pro Track racing circuit with a spectacular win in the International Keirin Cup in T-Town, Pennsylvania. He spent most of his summer training and racing with the Americans on Pennsylvania’s home track, and looks to electrify the crowd as the up-and-coming star of the PA Lightning.